Two interesting articles out of the UK’s Guardian newspaper crossed my desk this morning. One was about bones, and one was about money. 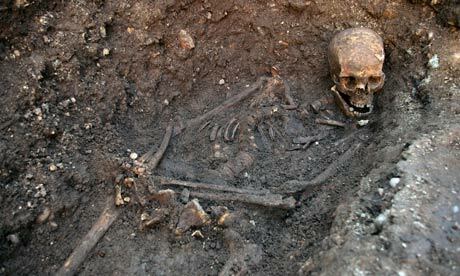 First, a team of archaeologists and historians in Britain have uncovered the bones of Richard III. For real. The bones tell an amazing and horrifying story of the last moments of the last Plantagenet king, and the last British king to die in battle. And, for those who have been wondering just how much Shakespeare’s anti-Plantagenet propaganda was fiction regarding the king’s twisted form, we can now genuinely say that physically, at least, his depiction was accurate. The team, working in a car park in Leicester, lifted the horribly severed skull, the arm and leg bones, and then the severely curved spine. The bones tell us something of his life, of his death, and of his treatment after death. Much of it was not pretty. The second article I found of interest was an interview with Robert Reich and Jacob Kornbluth about the documentary that swept the Sundance Festival and will soon be in wide distribution. Inequality for All is being called the economy’s equivalent of An Inconvenient Truth. Robert Reich has been talking about the staggering inequality between median incomes and the über-rich for decades, but his message hasn’t been a petulant whine about how it’s all so unfair. No. Consistently, Reich has been warning us that a shrinking middle class is simply bad for the economy, and that after a half-century of applied “trickle-down” economic theory, the failure of that experiment has become manifest. In 1978, the typical US worker made $48,000/year (adjusted for inflation). In 2010, that figure had dropped to $33,000/year. Plus, many costs for workers (healthcare, education) have risen. During the same period, the top echelon have seen their incomes almost triple. No one, including Reich, wants total equality in income. Disparities in income are what actually drive the machine of capitalism. Not making enough money? Work harder. Get a better job. Invest in a business. But the thrust of Reich’s argument–which real-life evidence seems not to be bearing out–is that the economy suffers when the income gap between middle-class and top-earners gets too wide. When the middle class is given an ever-shrinking piece of the economic pie, they can’t buy things, and when the middle class doesn’t buy things, the economy slows. It’s not that rich people are evil. They’re not. We’d all like to be rich. And here in America, we admire people who get rich because of that One Big Idea or who just work their asses off and make something of themselves. We love small businesses. We love entrepreneurship. But what we do not love is people who use the power that money can buy, and who twist the system to get even more money. We don’t like it when the middle class pays a higher percentage of our wages in taxes than the super-rich. And we really don’t like it when honesty and hard work do not pay off, but greed and cheating honest folk do. This movie garnered a special jury prize at Sundance and picked up a major distribution deal, so keep an eye out for it.